Our top-selling Springee Spinners Frog is finally back in stock! He's been completely upgraded with a new Cast Resin & Metal Design, and an improved fan within the body that spins in the wind better than ever before! Are you looking for a very special garden accent? Are you a frog lover, or looking for a unique frog present? Whimsical frog statues are tons of whimsy and fun! Frog gifts are fun to buy, but they are not always easy to find. The perfect frog gift is always unique, fun, and whimsical, but you also don't want another duplicate piece that will sit on the shelf next to all the other frog collectibles. Don't lose you're mind looking for crazy frog presents. This beautiful piece of garden decor will stand out with green pride no matter where it is placed. Home and Garden decor never looked this good! Our Springee Spinners are whimsical springy creatures with colorful bodies that spin in the wind! Each metal design is a work of garden art, hand painted and lacquer coated for brilliance and long lasting shine. Decorate your garden with these lovable whimsical outdoor pets. Guaranteed to entertain your flowers, not eat them! Makes an awesome gardening gift for all - including frog lovers! 6" Fan-center, 15" Tall, durable metal. Whimsical springed appendages, and fan-shaped center body that spins in the wind! New Cast Resin head & feet provide a new high level of garden personality. Metal fan in the center of body spins freely in the wind! Hand-painted with UV paint and lacquer coated for brilliance and long lasting shine. 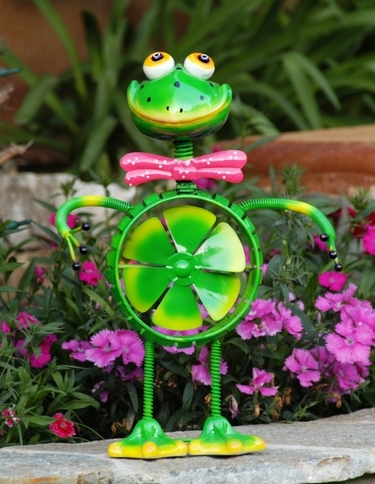 Bring colorful motion and fun to your garden with this cheery frog garden ornament!